I recently purchased an older home designed by the original owner, who was an engineer. He had kept all of his blueprints and his wife passed them on to me. The plans have come in handy, both for my own small do-it-yourself projects and when I�ve contracted with carpenters and plumbers for major remodeling work. Since many of my neighbors and friends are also renovating, I asked a few of them, �How did you find your house plans.� Their answers and advice may help you find your own. Those with newer homes started by locating the builder and asking for the prints. If you don�t know the builder, check with the real estate offices in your area. They usually have lists of the local construction firms and developers. Another good source of information is your neighbors themselves. They may have had the same builder or remodeler, or remember whose sign was in front of your home. 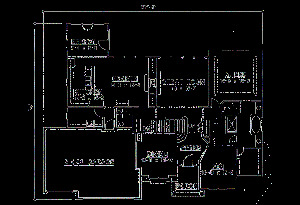 If you can�t find your plans but their floor plan is similar, ask if they have their blueprints. �Close� is often good enough to answer simple questions. If builders, realtors or neighbors can�t help, the next step is a trip to the office of your city�s building inspector. Permits issued by that office often include floor plans. These records can also tell you what modifications have been made to your house. If their filing system is modernized and computerized, they may be able to locate and print your plans quickly. If not, it could take a while. In older towns that may have been formed from other municipalities, you might have to visit another office. In smaller towns, they may often just point you to a stack of boxes and let you search for yourself. While at the city offices, find out where you can look at fire insurance maps. These sometimes contain drawings of homes and lists of construction materials use. If you have an older or historical home, City Hall often has archives of old photographs, maps and building plans. The city library is also a good source for this information and may even have a local historian who can help in your search. Still no luck? Your home is probably very old. Check with a local college that has a school of architecture � they often keep records of the area for teaching purposes. Museums and historical societies may not have building plans, but they often have old photographs, old newspaper stories or even advertisements that could show your home or similar homes. Any information you can derive from these sources could help builders, realtors or building inspectors find your plans. When all else fails, you�ll have to hire someone to recreate the original plans. Architects and structural engineers can inspect your house thoroughly and come close to drawing the original design plans and modifications. No matter how you found your house plans, do yourself and future owners of your home a favor and keep a copy in a safe place.